I’ve been a huge fan of Art and Franco’s for a very, very long time. I was thrilled when their Tiny Titans book became as popular as it did. My son may have been named after a certain Wolf Boy; okay he was totally named after Patrick the Wolf Boy. The Tiny, ‘Lil, and Itty Bitty line is moving across all sorts of comic publishers now and I can’t be happier. 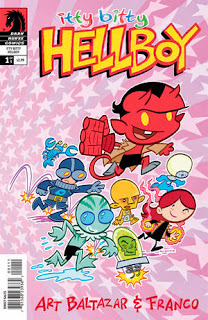 One of the newer titles is Itty Bitty Hellboy. This isn’t the first time Hellboy has been showed younger. Obviously there is the famous “Pamcakes” comic. Bill Wray also did the Hellboy Junior stories. Bill is famous from Mad and Ren & Stimpy; his Hellboy Junior stories are set in a similar tone. The Itty Bitty Hellboy has more of that Tiny Titans feel. It’s a cute, punny book that makes Hellboy available to an all age’s audience. Someone saw the Itty Bitty designs and must have said “those characters are so cute I wish I could hug them.” Because there is a line of plush Itty Bitty plush coming out. 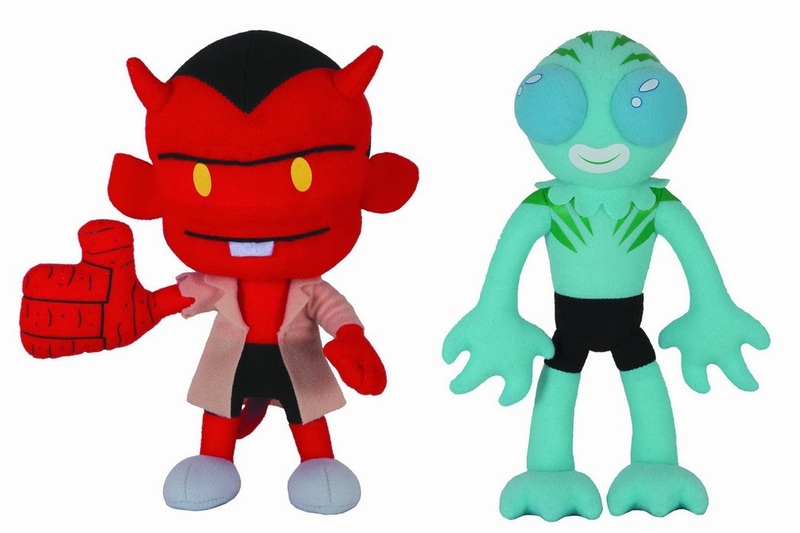 To start with you can pick up a Hellboy or an Abe. If these sell well I can’t imagine they wouldn’t add others to the line. I won't lie, I'd be pretty tempted if they added a Roger to the line. Both Hellboy and Abe sell for under 20 dollars and should be available for pre-order at your local comic shop or favorite comic website.